This article originally appeared on Total Retail, sister brand of Women in Retail Leadership Circle. Also, Platinum Circle Partners is a sponsor of Women in Retail Leadership Circle. Recently, the USPS proposed a record price increase. The proposed hike must first be approved by the Postal Regulatory Commission. If approved, which is expected, the higher rates will go into effect on Jan. 27, 2019. This will be the biggest rate increase in USPS history. The elimination of Commercial Plus Pricing (CPP), where now Priority Mail pricing will match Commercial Base Pricing (CBP). Many e-commerce and subscription trade shippers will be facing a painful price increase with the elimination of CPP programs. A conservative 5.9 percent Priority Mail increase is expected, while First Class Flat Pricing will change to zone-based pricing with an expected 11.9 percent increase. For shippers with a high proportion of outer zone shipments, the increase will be appreciably higher (as much as 21 percent). Perhaps most concerning is the pending reaction of UPS and FedEx as they re-evaluate their “hybrid” postal delivery products that use the USPS for last-mile delivery. Buried in the postal rate change are increases ranging from 9 percent to 30 percent on the work-share rate structures used by UPS and FedEx. For e-commerce and subscription trade organizations, steeper shipping prices have a direct impact on operating income and profitability. Beyond the obvious impact to the bottom line, shipping costs are a key factor for driving shopping cart abandonment. 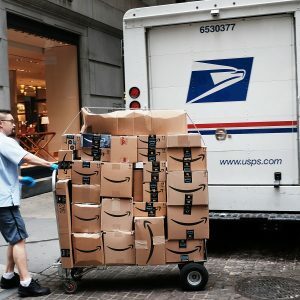 There’s been a lot of talk about Amazon.com and its relationship with the USPS, and what this rate hike would mean for the retail giant’s business. Amazon’s retail operating income would take a 5 percent hit from shipping cost inflation if the new rates take effect, according to predictions by Barclays analysts. They’re going to pass through a portion in January 2019. So how then can e-tailers protect current profitability and customer satisfaction with shipping costs perpetually on the rise? No doubt we’re approaching the height of the retail season, but you don’t want your shipping rates left out in the cold come January. It’s crucial to take back control of your shipping agreements by studying your shipping data in detail and developing custom requirements that best meet the service and price needs for your business. Organize a request for service and pricing response based on specifics of what’s meaningful to your business. Remember that every element of your carrier agreements are negotiable. Be proactive with including all carriers that meet your service requirements in your RFP process, as a competitive process undoubtedly yields incremental savings. Model proposed rates and surcharges to your specific distribution footprint, which is the only way to measure the precise value of any proposal. E-tailers receive inventory from many suppliers, and in most cases the e-tailer pays for shipping. Requiring your vendors/suppilers to directly bill your account helps your organization in multiple ways. First, it allows you direct visibility into these shipping fees which are often hidden or “included” in vendor handling fees. Therefore, it eliminates the possible padding of any shipping fees. Second, the additional revenue may allow for deeper shipping discounts. In addition, direct billing these shipments to your account number allows for simplified accounting and invoice reconciliation as carrier billing systems will subtotal these charges for you upon request. Every year, billions of dollars in guaranteed service claims and rating/charge errors are never recouped as carriers don’t make it easy for shippers to audit parcel invoices. No shipper is exempt from carrier billing errors. Consistently performing invoice audits not only lend to 3 percent to 7 percent cost recapture, but also lead to better understanding of your company’s distribution footprint and service highlights/areas for improvement. Having command of your shipping data through detailed analytics and management reporting puts you in a position of strength when negotiating with carriers and controlling your bottom line. This is a historic postal rate increase in both size and complexity to the market. If there was ever a time to get the upper hand, it’s now. Reach out to see how an expert at Platinum Circle Partners can help you today. Patti Hester is chief strategist, e-commerce and retail distribution, for Platinum Circle Partners, a professional services firm dedicated to helping its clients uncover their best options to reduce total cost and improve service value in their small package distribution operations. She is also one of the sponsors for the Women in Retail Leadership Circle. Patti can be reached at patti.hester@platinumcp.com.